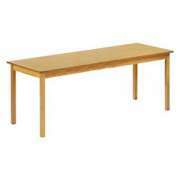 Whether you are furnishing a science lab, art room or classroom, Allied Plastics has great tables. With specialized designs for virtually every room in your school, you can get all of the Allied Plastic school tables you need from Hertz Furniture. Don&apos;t compromise on your ideal design because of a limited selection. A variety of shapes, colors and sizes lets you choose the perfect library, training room or drafting table. With 25- and 30- year warranties, you can be sure that this durable school furniture will serve your students and faculty for many years to come. New educational trends are increasingly focusing on the importance of small-group work and study sessions. In order to facilitate this style of learning, a school needs some appropriate activity tables. School tables come in many shapes and sizes including classic round and rectangular options as well as some vibrant fruit-shaped tables. With so many options, elementary school students can enjoy an arrangement that is perfect for their classroom and educational needs. Even your youngest students need a place to sit while they eat snack, practice writing their letters or work on art projects. 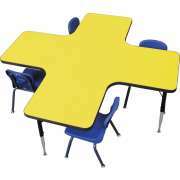 Preschool tables are a must-have for an early-childhood classroom. They are versatile and sized just right for young learners. Having special preschool furniture will show your students that you care and help them develop critical skills in a proper way. In higher grades, less work takes place around classroom tables, and school desks become increasingly important. It is always tricky figuring out how to arrange a learning space so enough classroom desks fit in the allotted space. Two-student desks help save space while providing a clear individual work surface for each student. While regular classroom furniture is quite important, there are other items that are also important for a school to have. 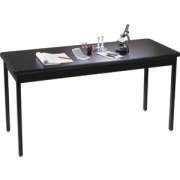 Lab tables are essential for a student science lab. They enable budding chemists and physicists to conduct experiments freely without damaging furniture. 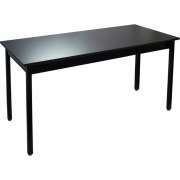 When choosing science tables, the most important detail to pay attention to is the surface material. Science lab tables have varying grades of resistance to chemicals and extreme temperatures, so every school needs to make sure that the model they choose can support the materials that are being used. 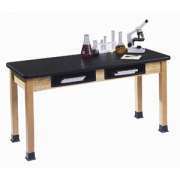 A proper lab table should be complemented by an equally appropriate stool. Lab stools are often used in a science classroom because many experiments are conducted on a raised surface and it is important for young scientists to have easy access to all necessary materials. 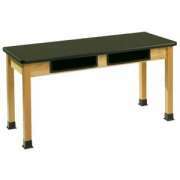 Allied Plastics has some attractive wood stools that can be used in a science lab, art room or other location. Encourage proper study habits by furnishing a reading room with enticing school library furniture. 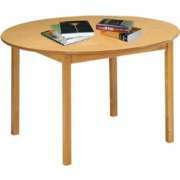 Library tables can provide a great space for students to collaborate on group projects or cram for a big test. Natural wood reading tables will fit in perfectly with other library furniture to create a relaxing atmosphere that promotes focus and productivity. In a school which hosts an art program, special tables are required to help students produce the best work they can. 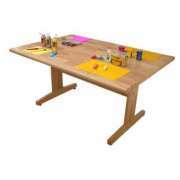 Drafting tables are ideal for sketching and painting. 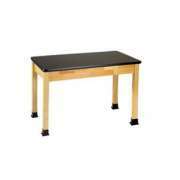 Large work surfaces are available in both laminate and wood, so any school can enjoy proper drawing tables, no matter what their budgetary concerns are. Art tables will help budding young painters, sculptors and illustrators hone their skills and develop their talents. 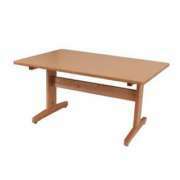 Folding tables are useful to have in any institution or business. They are easy to set up and move around, and don&apos;t take up much space in storage. They can be used as banquet tables for a classy event, extra lunch tables or even special project spaces. 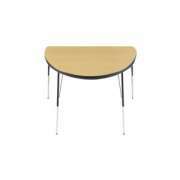 Allied Plastics offers both rectangular and round folding tables in a selection of sizes and surface colors. 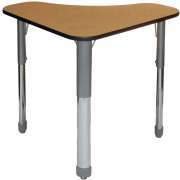 Slimmer folding tables make excellent training tables because they are sturdy yet easy to arrange. For a more permanent arrangement, there are also seminar tables with fixed legs. This option is ideal for a company that hosts many training sessions, courses and conferences. Training room tables come in a wide range of sizes, so every company and school can order the size that best fits their space. When you are looking for furniture for a professional or educational environment, Allied Plastics is a great place to turn for tables. With so many styles and shapes, the possibilities are endless. Feel free to arrange lab tables, seminar tables and school tables according to personal preferences and spacial requirements.